Dates: 8 - 24 June 2017, Thurs-Sat. Choreographed by Neil Fisher & Fleur de Thier. Directed by Mike Friend. Let’s Not Argue is the story of every relationship told with movement and words. It depicts the best, the worst and the funniest parts of the everyday interactions between husband and wife, including the ever-changing gender roles and relationship dynamics. 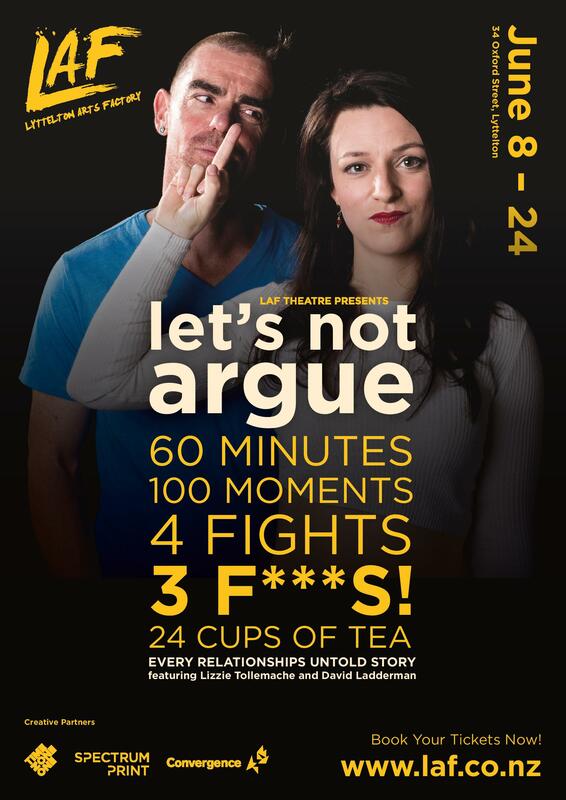 Let's Not Argue acknowledges the parts of relationships that make us human. But it’s not too serious… and it’s not for kids. Directed by Mike Friend, founder of the Lyttelton Arts Factory (formerly Loons Theatre), and choreographed by UK based Neil Fisher, who is internationally renowned for his work, the show features Christchurch's well-known and much-loved couple David Ladderman and Lizzie Tollemache.